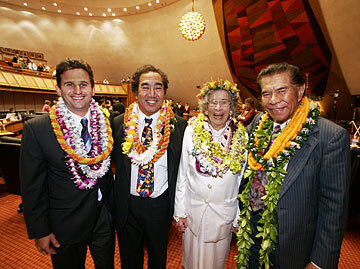 Yesterday's final day of the 2006 Legislature meant farewell for House members Brian Schatz, left, Dennis Arakaki, Helene Hale and Ezra Kanoho. Also bidding goodbye were Rep. Bud Stonebraker and Sens. Bob Hogue and Brian Kanno. Seven state lawmakers are bidding aloha to the Legislature, including two who have set their sights on the U.S. Capitol. State Sen. Bob Hogue (R, Kaneohe-Kailua) and state Rep. Brian Schatz (D, Makiki-Tantalus) will not be seeking re-election to the Legislature and instead are running for the 2nd Congressional District post being vacated by U.S. Rep. Ed Case, who is seeking to unseat fellow Democrat U.S. Sen. Daniel Akaka. Hogue, Schatz and other departing lawmakers said goodbye to the Legislature yesterday, the last of the 2006 session. "If I didn't mention you by name, it is because you are probably running for Congress against me, and I don't want to end up in your literature," Hogue told fellow senators, several of whom are also eyeing the congressional seat. Hogue said he will begin campaigning. Schatz, who was the youngest member of the Legislature when he was elected in 1998 and is so far the youngest congressional candidate, said he has learned many lessons during his tenure. "I've learned that if you want to interpret the Hawaii Constitution, the best way is to lean over and ask Helene Hale what she meant when she wrote it," Schatz, 33, joked during his floor speech. Democrat Helene Hale, the oldest member of the Legislature, is ending her 52-year political career. Most of that career was at the county level on the Big Island and as a state 1978 Constitutional Convention member, but she has spent the last six years in the state House representing Puna. "I never expected that I would come to the state Legislature at 82 years old," said the 88-year-old Hale, drawing applause from other House members. "I have not regretted it." Another neighbor island representative is also leaving. State Rep. Ezra Kanoho, a Kauai Democrat, decided last year that he would not run for re-election. "I've been thinking about this day and this moment with a lot of trepidation. I was thinking of not showing up for session today or escaping before this came about," said Kanoho, who has been in the Legislature for nearly 20 years. And veteran lawmaker Rep. Dennis Arakaki announced this week that this will be his last term. Arakaki, the House health chairman who has been seen as a champion of the downtrodden, said he has taken to heart what was told to him when he first started in the Legislature 20 years ago. "All we bring with us is our integrity and our word. And when we leave, all we have is a judgment on how well we kept our integrity intact and how well we kept our word," he said. Sen. Brian Kanno, whose union-friendly positions have caused him controversy during his 14 years in the Senate, said he is finishing a master's degree and will work at Child & Family Service. Rep. Bud Stonebraker, who is also leaving, was not present on the Legislature's last day. Reporter Richard Borreca contributed to this report.